One of the other new features on the 2013 F800GS is a traction control system. “There’s a switch that allows you to turn the traction control on and off. When you leave it on it basically cuts the ignition whenever the rear tire is spinning, which keeps the tire from rotating when you don’t want it to and helps to keep the back of the motorcycle behind you,” said Guillien. Because the F800GS has long -travel suspension, one of the features Guillien feels makes the F800GS such a great bike off-road, some people, however, feel that it’s a little too tall. So for 2013 BMW is offering a lowered version of the F800GS, which, according to Guillien “is great because it allows more people to have both feet on the ground and be comfortable.” However, if you have an F800GS that is older than 2013, Touratech offers a lowering kit which decreases the seat height of the older model bikes. 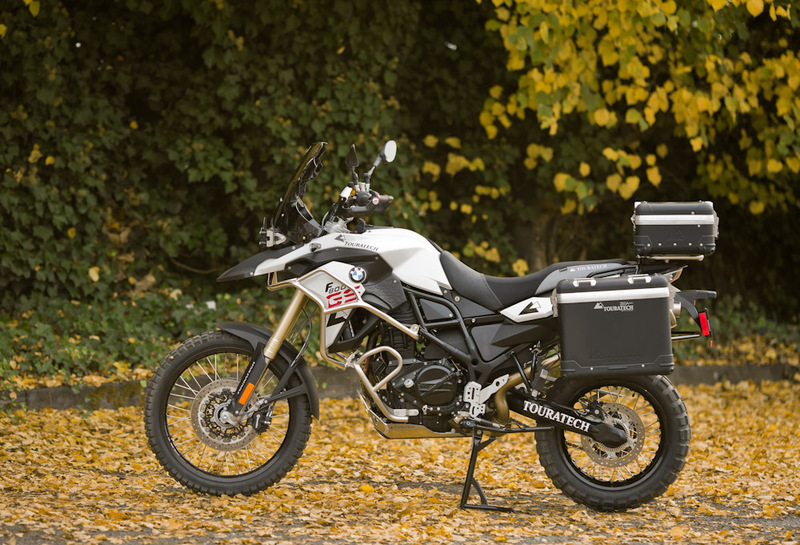 Click HERE for a look at all of the Touratech accessories available for the F800GS.